Levi had an annual appointment at the CF Clinic today. An annual appointment means there are lots of people to see, and we stay a long time. I thought it might be interesting to take you all along, sort of. It’s not really a very representative day in his life, so the title is probably misleading. And it’s looooooong. Because that’s how our day was. Feel free to voice your displeasure in the comments. 6:30 AM – Paul (who has already gotten the kids up and started Levi’s morning treatments) opens the bedroom door and says, “You know you’re half an hour from when you said you need to leave, right?” He responds to my moan of displeasure with, “Don’t stomp around all mad at me if you’re late, then.” I don’t know why he would say that, because it’s never happened before. No, I don’t have my fingers crossed. I can’t believe you’re doubting me on this. 7:11 AM – Levi and I pull out of the garage. Usually, this would mean that I looked down immediately and noticed that the gas light is on. Happily, I filled up a couple of days ago, so I won’t have to sweat it out to downtown Akron this morning. 7:13 AM – I discover, as I pull onto 585, that I should have paid attention to that nagging feeling of forgetting something. My awesome iced coffee is sitting at home on the desk. If I go back for it, we will no longer be even close to on time. Oh well. Diet Coke it is. 8:03 AM – We walk into the clinic lobby. At just three minutes behind schedule, I’m calling it a win. Levi grabs a mask and goes to see the fish tank while I check in. 8:05 AM – We’re in our appointment room. At CF clinic, we go back to our room more or less immediately and do our waiting there – CF patients can pass nasty bugs back and forth with one another and infection control guidelines mean they need to stay away from each other as much as possible. Once we’re back in the room, Levi gets to take off his mask. 8:21 AM – Levi pulls everything out of his backpack. The Leapster and game cartridges litter the floor, along with coloring books, crayons, and other toys. I don’t bother to pick anything up. We’ll be here awhile, and it’ll just be down there again in thirty seconds. 8:35 AM – We go to get weight (just Levi, thankfully!) and other vitals taken. He’s grown nearly an inch and gained just about two pounds in three months, which is great. His weight is now in the 89th percentile compared to other kids his age. When he was around a year old, he was in the 15th, just for some perspective. The hospital has great wireless, so I check my work e-mail to make sure nothing needs immediate attention (I’m officially off, but I can’t help myself). I am happy to see there is nothing that can’t wait. 8:50 AM – One of the nurses comes in and runs down the medication list to make sure we’re all still on the same page. While we’re talking, Michele pops her head in. She used to be the pediatric social worker for the CF clinic, but has been promoted and manages other social workers. She has with her Christine, the new pediatric social worker for the clinic, who is on her third day of work. Michele wants to know if she can hang out with us while everyone visits us for the annual appointment, so she can get a sense of what the day is like for patients and families. I am delighted to agree, not only because I don’t mind at all, but also because I can leave Levi with her for a minute and go to the bathroom by myself. 9:15 AM – A new intern from behavioral health comes by. This is not called psychology, but only because that freaks people out. She asks if we’re having trouble with treatments or behavior. We’re really not, so she talks to Levi a bit (when he can be torn away from his Leapster) and takes off. This is a new addition to the CF team, and I’ll be honest … it was making me a little paranoid until I asked and found out that everybody sees behavioral health now, and they weren’t sending them in just because I’m a terrible parent. 9:30ish AM – Susie, the respiratory therapist, comes in. She checks on how Levi’s doing with his Vest, and decides he should bump up the frequency – of the vibration, not the amount of times we have to do it – and the pressure. I ask for some fish masks for his nebulizer, since our last one broke last week. We’ve been using the purple dinosaurs, but he likes the fish better. The best thing she has for us today is an acapella. It’s a breathing treatment that can, once he learns the technique well, sometimes replace the vest. It’s a whole lot more portable than the Vest, so it’ll be great for traveling. He hasn’t been old enough to use it until now. We’ll have to practice, but this is pretty exciting. We’ll get the actual device later today. 9:45ish AM – Time for the geneticist. We see the same lovely woman every year, but I can never remember her name, because she doesn’t figure much into our clinic visits. We don’t really know much about Levi’s biological family history, we’re not worried about the biological children we can’t have carrying the same condition that we didn’t pass to Levi, and we’re certainly not yet thinking about him having children. (Mercy. Just typing that makes me want to lie down with a cold cloth on my head.) She is lovely again, and we smile at one another and make basic small talk for a few minutes, and she’s off. I break out the snacks, trying to ward off both hunger and boredom. 10:30 AM – Time for the doctor. We’re seeing a new doctor today, and so far, she’s just great. She listens to Levi’s lungs and belly, checks his throat and nose, and looks in his ears; she’s even been warned by the previous doctor to check for foreign objects. (Last time Dr. Spoonhower saw him, he asked why she was looking in his ears, and she said, “Because I know how you are.”) Levi is declared in great health overall, and he’s gained so much weight that he needs to take more enzymes. This means new notes for the school with updated dosages, too. 10:45ish AM – I confess to Levi that I actually did bring the iPod along, and if he picks up all the other toys, he can play Angry Birds until he burns his retinas. (Okay, I actually stop talking at “Angry Birds.”) Why doesn’t he pick up toys this fast at home? 10:50ish AM – Dietitian visit! I think this is actually a memory test for me, because I’m supposed to list a typical day of food. I’m not coming up with a good answer for what happens at suppertime, so Jamie takes pity on me and says, “Well, what did you have last night?” and honest-to-goodness, I have no idea. I need more sleep. Or maybe a personal assistant. I dredge up a few meals we’ve had recently, and Jamie lets me off the hook. Levi is doing so well with weight that we’re backing off of one of his supplements. We can always add it back in if he starts losing weight. 11:15ish AM – Someone from physical therapy comes by. I’ve never seen her before, but she’s great with Levi and gets him to stand on one leg and do some other physical tests. Then she asks him to draw, and to define a bunch of things, which is hilarious. A ceiling is the thing that keeps the birds from coming in, if you didn’t know that. 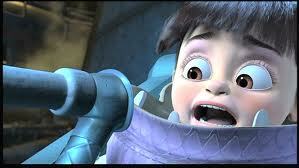 Then she pulls out the acapella, and teaches Levi how to use it. Me, too, because I’ll need to practice with him at home. I try it out as a demonstration. It’s a weird feeling – you’re breathing out into a tube, but you can feel your lungs sort of shaking. I’ve never been able to try the Vest because, hello, I don’t fit into the same size Vest as a preschooler. I wonder how similar it feels. 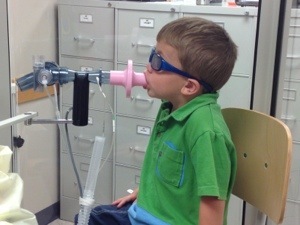 12:15ish PM – Someone realizes that Levi hasn’t done his PFTs (pulmonary function tests). This is kind of new for us (you have to be able to follow instructions well), so we’re not all used to it yet. We zip down the hall to the PFT room, and get Levi all set up. I know what you’re thinking, but I promise this is a breathing test and not a scream extraction. 12:45ish PM – Michele comes by again to walk through the social work portion with Christine, and to check on Levi and our family. I’m kind of fried by now and Levi is definitely feeling it. He goes through more goldfish, two Rice Krispie treats, and a fruit roll-up, and doesn’t cooperate much with her questions. This ain’t her first rodeo, though, and she doesn’t push it much. 1:00 PM – The other nurse comes in to take a throat culture. Levi calls this “the gaggy thing” and it’s his least favorite thing next to shots. If he can learn to huff cough and spit into a cup, he can stop doing the gaggy things. Essentially, they want me to teach my child to hock a loogie. I decide this is a job for Paul. 1:05 PM – We go to check out, and make an appointment for November. (Woo!) The rep at the desk says, “Wow! You were here a long time!” and I reply that it actually went pretty quickly. I laugh at myself for thinking five hours is quick. 1:07 PM – We walk out the clinic door. I promise Levi lunch anywhere he wants. 1:45 PM – Levi, having requested curly fries from Arby’s, does not even hear me order them. It was a good day, and everything really did go well. 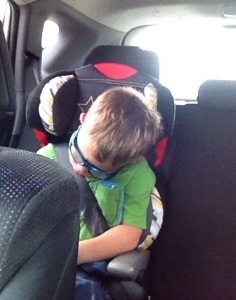 But I kind of wish I could have passed out on the way home, too! Next Post Why Is Your Nose So Long? So happy for a great clinic visit.